Pesto is a sauce that seems to be universally adored but I think the addition of roasted garlic takes things to the next level. The sauce will keep for up to a week in a sealed container in the fridge (but I doubt it will last that long!). 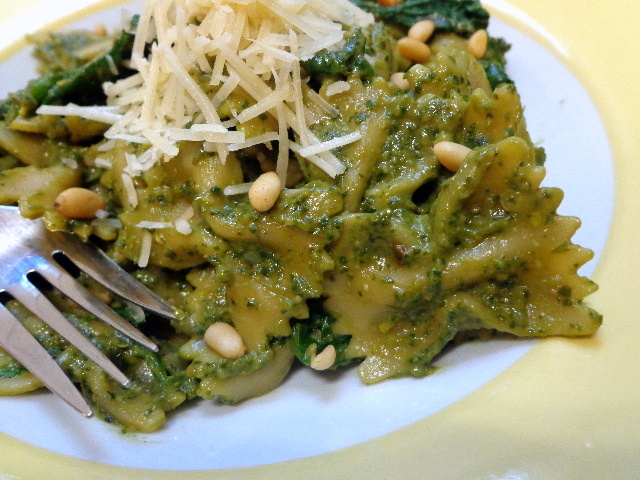 I recommend serving it tossed with your favorite pasta, with extra cheese and pine nuts on top. Peel back several layers of skin from the garlic cloves; you want to reduce the amount that burns in the oven but leave enough layers intact so that the cloves are still held together. Slice off the tops of the garlic bulbs, exposing most of the cloves in each bulb. Place bulbs on a baking sheet, and drizzle a Tbsp of oil over the exposed garlic. Roast garlic for 40 minutes. Set roasted garlic aside. When the garlic is cool enough to handle, gently squeeze the base of each bulb and the cloves should slide right out. Place basil and remaining 1/4 cup oil in the bowl of a food processor and process 30 – 60 seconds, until smooth. Add roasted garlic, pine nuts, parmesan, and salt to the bowl and process until well-combined, scraping down the sides occasionally.